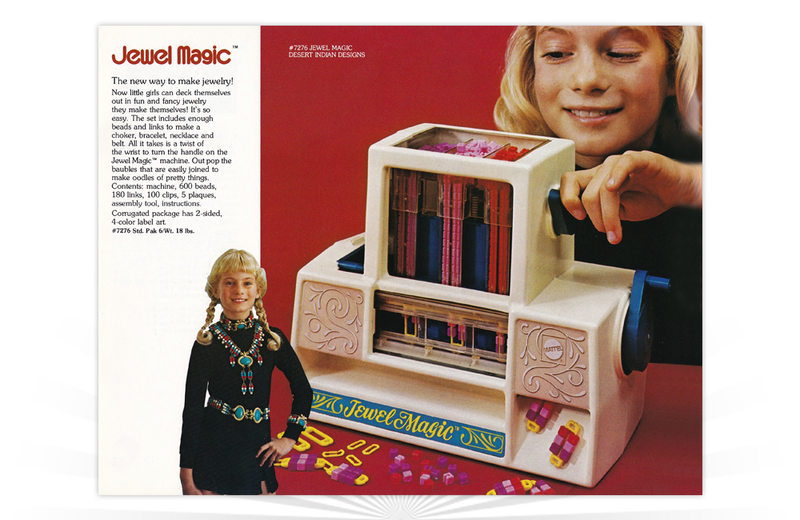 A 1975 dealer advertisement for Jewel Magic from Mattel. When loaded with beads, the Jewel Magic machine produced “oodles of baubles ‘n bangles” at the turn of its handle. Individual pieces could be linked together, allowing kids to create custom jewelry on the fly. Mattel included 600 beads and 100 links in each box. Refill kits were sold separately. An advertisement for Tinkertoys from Playskool. The company acquired Tinkertoy in 1985 and redesigned the toy in 1992 for its 80th anniversary. Tinkertoys were inducted into the National Toy Hall of Fame in 1998.